John Baggett, left, principal of Margaret Scotten School and director of educational programs for the Grass Valley School District, discusses issues facing educators during a gathering of the Contemporary Issues Study Group, organized by David Baker, right, for PEACE Lutheran Church in Grass Valley. Children in western Nevada County need mentors, a Grass Valley School District official told members of the Contemporary Issues Study Group. 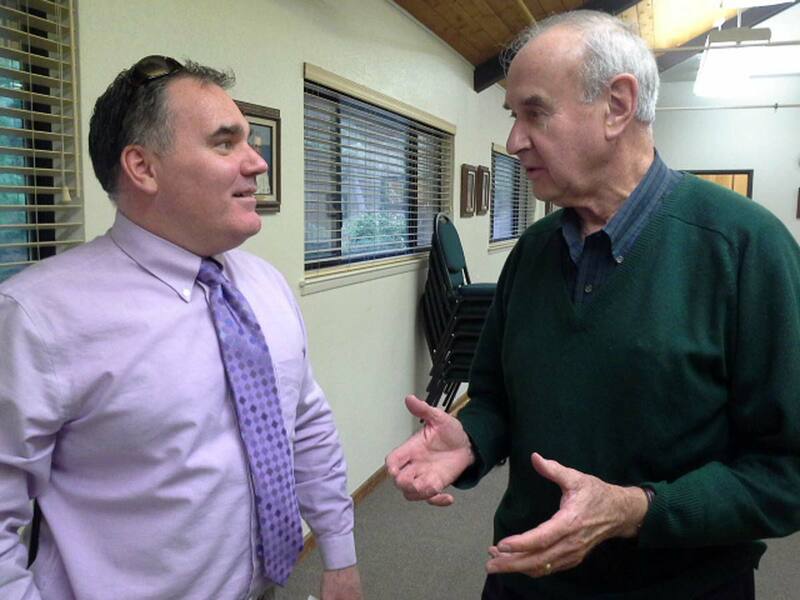 “Offer your skills,” said John Baggett, principal of Margaret Scotten School in Grass Valley. “Read to a kid. Mentoring is good because a kid knows people care besides the parents.” He also asked for someone who could coordinate parent volunteers for the K-4 school. Baggett described the cutting-edge technology being used in Grass Valley classrooms, and how members of the faith community can support students, during a recent gathering of the Contemporary Issues Study Group. This free community service is offered at 9:15 a.m. Wednesdays in coming weeks by Peace Lutheran Church, 828 W. Main St., Grass Valley. The study group’s current topic is “Issues Facing Our Local Officials.” Church members will use information gathered at these sessions to help them discern Peace’s mission in the community, organizer David Baker said. Grass Valley schools are making strides as teachers grapple with the impacts of low income: 70 percent of students participate in the program for free or low-cost lunches, Baggett said. “Grass Valley is on the cutting edge” of using technology in the classroom, Baggett said. Students use iPads and iPods to do some school work, and teachers know immediately if students are having trouble with a concept. “We’ve got dual (English-Spanish language) immersion. We are hiring. We are not declining in enrollment. We are going up for the first time in three years,” Baggett added. “Families are struggling financially to put food on the table, and they’re also struggling with drug use, and probably a lot of those (problems) are interrelated,” Baggett said. For those families, “the last thing they’re worried about is reading to their kids,” Baggett said. Future speakers at the Contemporary Issues Study Group are Grass Valley Mayor Dan Miller, Feb. 5; Nevada County Executive Rick Haffey, Feb. 12; and Nicole Pollack, director of Nevada County Department of Social Services, Feb. 19. For more information, visit www.PeaceLutheranGV.org or call (530) 432-8935.